Useful tool for AF calibration. Requires camera that supports microfocus adjustment. Focus Calibration. While microfocus can be set without a LensAlign, the process is made much more simple with its use. It allows for quick, easy correction of front- and back-focusing. 10.5-Inch Focus Display Ruler. 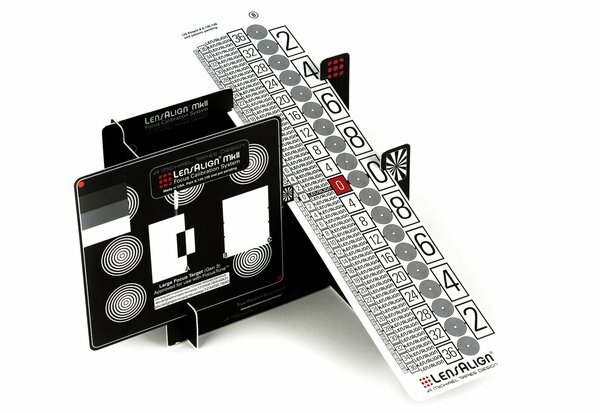 Held in-place at a 20º angle, this ruler supports calibration of most lenses. As a rough estimate, the recommended testing distance is 8.2 feet for each 100mm of focal length. For more exact measurements, you can use the LensAlign Distance Tool found on their website.